The Astronomy Grads Network (AGN) serves to represent and promote the interests and visions of graduate students in the Astronomy Department and Space Sciences Building. AGN also aims to foster a sense of grad student community and to increase awareness and enthusiasm for Astronomy at Cornell and within the general public. To these ends, it holds a variety of events each year, including a weekly Grad Student and Postdoc Seminar (often followed by an informal get-together at the "Red Barn"), ice cream socials, informal dinners with Astronomy faculty, and camping trips to nearby dark sky preserves and the Adirondacks and more. 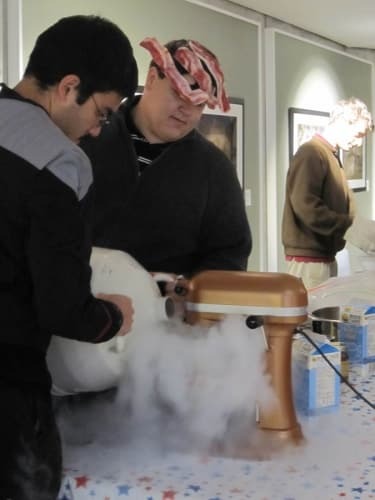 The AGN is actively involved in organizing outreach events for the larger Ithaca community, such as the "Ask an Astronomer" and Halloween "Museum in the Dark" event (the photo shows Carl Ferkinhoff and Michael Lam making Liquid Nitrogen ice cream at 'Museum in the Dark' in 2011). Fellowships that astronomy students can apply for. Ask around for advice on applications, many graduates have applied to these in the past. Must be US citizen. Has outreach component. Hertz Foundation Late October Hertz link Must be US citizen. College Seniors and 1st year grads only.